Hendrix is remembered for hits like "Purple Haze," "Foxy Lady," "Little Wing" and "Voodoo Chile," as well as well as for covers of "All Along the Watchtower" and other songs. He died in 1970, ending his brief stint as one of the pioneers of rock. 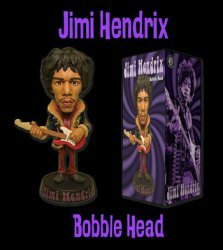 Bobble head is approximately 7" tall and cast in durable polyresin for stability and exquisite detail. Concept art by Don Howard Studios. Sculpt and paint by Sean Sansom. Collectors Note: Hand-numbered limited edition of 2,500. Copyright Authentic Hendrix LLC.